What ballet dancer’s list would be complete without the Bolshoi Theatre. Right in the heart of the city, stands this symbolic, classical architectural structure; home to the Bolshoi Ballet, Bolshoi Orchestra and Bolshoi Opera. Designed by Joseph Bove, it opened on 20 August 1856, on Tsar Alexandra II’s coronation day. The New Stage opened on 29 October 2002 and the main (Historic) stage was reconstructed and refurbished between July 2005 and October 2011. I’ve been lucky enough to see performances on both stages including La Bayadere, Coppelia, Paquita, Spartacus, Swan Lake, Giselle, Jewels and the Pharoah’s Daughter. Many great Russian dancers have danced at the Theatre – in the short time I’ve been here in Moscow I’ve seen Svetlana Zakharova, Evgenia Obratsova, Artem Ovcharenko, Natalia Osipova, Ivan Vasiliev, David Hallberg, Olga Smirnova and Simon Chudin. The Bolshoi Theatre is a real symbol of Moscow for me as it’s the first sight I see as I exit the Ohotny Riyad Metro station, and, therefore, I’ve seen it in all its different manifestations: night time, day time, across all the seasons, in the snow of winter and the simmering heat of summer. And it’s a stark reminder of why I’m here; to perform in a theatre such as that one day! What a discovery! Jaggernath is a very reasonably priced, brightly decorated vegetarian restaurant serving healthy “eastern” food, buffet-style. It’s every student’s dream. There are four Jaggernath’s in Moscow and they each also retail a vast range of healthy vegetarian food products. My favourite restaurant is in Kuznetsky Bridge which is in my favourite part of the city, just behind the Bolshoi Theatre. Jaggernath has become an almost weekly ritual for me here due to its incredibly cheap yet delicious food – who knew that I would be able to find such good quality vegetarian fare in a city so renowned for its meat-loving diet. I love to stock up on my green vegetables here with my favourite palak paneer and I can’t help but always go back to my stock choices of scrambled paneer and the mixed daal. I love the carefree atmosphere; it’s a fantastic place just to sit and chat for hours at a time amongst a really eclectic mix of people who all seem to be drawn to Jaggernath’s eccentricity. Funnily enough, I really seem to have introduced a substantial number of students at the Bolshoi Ballet Academy to this fab café as I’m always now bumping into people I know there! A kremlin is a fortified, walled complex found in Russian cities. The Moscow Kremlin is perhaps the most famous one, although the term is often used to refer to the government that is based there. It overlooks the Moskva River to the south, Saint Basil’s Cathedral and Red Square to the east, and the Alexander Garden to the west. The Kremlin walls and towers were built between 1485 to 1495 and they enclose five palaces and four cathedrals within an area of 275,000 square metres. Each is inspiring and the artwork that adorns the walls inside is unexpected and beautiful. The one time that I fully toured the churches and surrounding buildings was a truly breathtaking experience, however, I’ve also visited the area twice more as an audience member of the Kremlin Theatre. Though this theatre doesn’t compare in grandeur and spectacle to the Bolshoi Theatre, it is much more convenient and comfortable as every seat gives a good view of the stage. The best performance I’ve seen in Moscow was at the Kremlin Theatre – at the Stars of the 21st Century gala which I wrote about here. St Basil’s Cathedral is an iconic representation of Moscow. Officially known as the Cathedral of the Intercession of the Blessed Virgin on the Moat, it is situated at the base of Red Square and it is a visual treat with its colourful and remarkable, fairy tale-esque appearance. The Cathedral was ordered by Ivan the Terrible to mark the 1552 capture of Kazan from Mongol forces. It was completed in 1560. Although it has had many additions and gone through many refurbishments, it has remained unchanged since 1860. Internally it consists of many tiny rooms, galleries and walkways with the most intricate and beautifully painted walls. At every sight of St Basil’s, I’m newly awestruck by its unique fusion of colours, shapes and once inside, the contrast between the soft, chalky wall decoration and the loud vibrancy of its exterior – I truly feel like it’s craziness controlled and channelled into creativity. It appears as if from the imagination of a small child and yet the components all fit together into an architectural masterpiece. GUM is a department store full of designer brands in the Kitai-gorod part of Moscow. 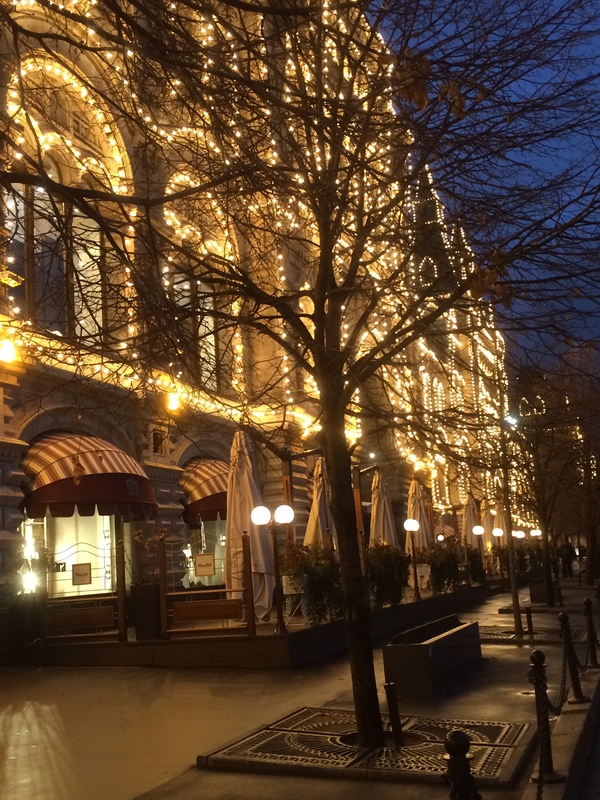 This beautiful building occupies most of the east side of Red Square. Built in 1890, it comprises three floors with a glass roofed central courtyard spanning the whole length of the building which provides lots of light. The floors are connected by elegantly designed bridges giving the whole area a graceful look. At the centre of the complex is a fountain that serves as a favourite meeting place and a photo opportunity. GUM was converted into office space in 1928 by Joseph Stalin. After reopening as a department store in 1953, it became one of the few stores in the Soviet Union that did not have shortages of consumer goods, and, therefore, became famous for its queues of shoppers which often extended right across Red Square. Nothing prepares you for the sheer magnitude of GUM. And not only that but the pristine elegance and style that hits you upon entering. Here is a place you’ll want to spend more and more time in to search out every chic designer store and beautifully-crafted window display that this magnificent department store has to offer. I actually enjoy just taking a little time to wander in, even when I don’t want to buy anything, as there’s something almost therapeutic in gazing at the glass jars and cabinets of jewel-like cranberries, dried rose petals, shiny glazed chocolate covered nuts and many other wonderful products. Their tea infusions are phenomenal; with everything from dried pineapple to whole dried lavender flowers creating truly magical flavours. Fresh is located on Bolshaya Dmitrovka Street. It is a vegetarian and vegan restaurant using organic and environmentally friendly products. Established in 1999, it is actually a Canadian company so has outlets outside of Russia. Fresh is a little more expensive than Jaggernath, for example, so I only come here for a treat but when I do I’m never disappointed with the interesting choices of vegetarian burgers, wraps and best of all the fantastic array of drinks. Fresh is really creative with beverages; they have a huge list of smoothie-based combinations plus juice mixes and hot soya milk based coffees and teas. One of my favourite smoothies is made of soya milk, banana, strawberry, dark cocoa powder and maple syrup. The cool, calm interior makes for a relaxed atmosphere where you can sit and chat or simply soak up the surroundings of this trendy part of town. The Happy Vegan Shop is a more recent discovery. Located in Kropotkinskaya in the centre of Moscow, it retails lots of vegetarian and vegan products. It’s a little bit of a trek from the Metro station and, being situated in amongst a bundle of apartments, it finds itself in quite an unlikely location. This, however, is one of its most appealing qualities for me as I feel like it’s a secret that only a few people in Moscow know about! The produce there is a lot cheaper than any of the other stores that sell vegan products that I ‘ve come across so far. The shop owners are extremely friendly – they recognise me every time I go now – plus I’ve been offered a free cup of tea and biscuits at almost every one of my visits. I’ve no need to re explain my regular purchases of soya milk and nut butter as they already know and have it ready for me to buy! The Cathedral of Christ the Saviour is the most beautiful building. It is on the northern bank of the Moskva River, in the Kropotkinskaya area. With an overall height of 103 metres, it is the tallest Orthodox Christian church in the world. The original church on the site was destroyed in 1931 during Communist rule. It was supposed to make way for the Palace of the Soviets, but this was never built. An open-air swimming pool measuring over 130m in diameter was commissioned in 1960 instead. In 1994, the swimming pool was closed, and in 1995, the foundations for the cathedral were laid. The first service was held on December 31, 1999. I’ve always thought this was the most beautiful cathedral in Moscow – it’s ivory white and burnished gold exterior is really striking while the vast expanse of intricate designs inside have quite an overwhelming effect. It really is one of the most beautiful sights in the city! Gorky Park was opened in 1928 but underwent major redevelopment in 2011. Upon entering the 300 acre site from the Park Kultury Metro Station via its huge entrance gates, you can walk along the Moskva River, have a picnic or a drink. It is divided into different zones for a variety of recreational activities. There is a stage for concerts and an ice rink along with volley ball courts and an open air cinema. It’s a fabulous space. I find Gorky Park best in the summer time when everyone seems to flock there to soak up the sun. In addition, Fresh have now opened a kiosk there so I’ll be able to enjoy their drinks while I soak up the sun. 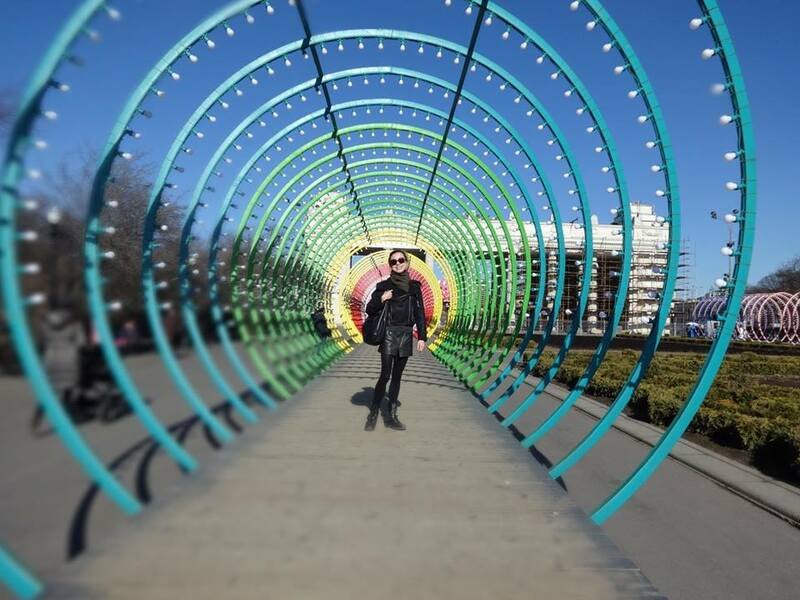 It’s my plan for the summer to go and relax in Gorky Park in my free time, sun bathing with a delicious refreshing Fresh drink! The Pushkin Art Gallery is located in Kropotkinskaya. Originally opened to the public in 1912, it contains many of the works of the European impressionists and post impressionists. The building that houses the gallery was designed by architect Roman Klein who copied the Greek style, decorating it with magnificent ionic columns so that it stands proudly in front of the Cathedral of Christ the Saviour. The founder and first Director Ivan Tsvetaev, persuaded the government and patrons to fund the gallery, as well as ploughing his own funding into the development. When I visited I saw lots of my favourite artists including Kandinsky, Matisse and Gauguin. This gallery is rather special for me for that reason – it’s simply a massive collection of all my favourite artists from possibly my favourite period of art. I could literally spend the entire day scrutinising every piece that hangs from the art gallery walls as I find the place just so fascinating. The Upside Down Cake Company can be found in Gruzinskaya. It took me a while to find it the first time, but it was well worth the hunt! They serve amazing desserts, all freshly baked and beautifully made. The shop itself is a treat for the eye – with everything laid out and presented in order to provide maximum temptation. They serve lovely breakfasts, including traditional Russian syrniki – they are like cottage cheese pancakes. Upside Down Cake Company, UDC for short, was created by an American coming to live in Moscow and so possesses a great blend of Russian and American baking. I never ever know what to get here and it’s scarily tempting to buy the whole cake display not to mention the irresistible American pancakes with butter and maple syrup. It’s open from early in the morning til late at night so you can go for breakfast, brunch, lunch, tea and dinner! After 9pm there is also a discount on the whole menu! I am a big fan of the Moscow Metro – here I am outside the Frunzenskaya Metro station. You have to watch out that you don’t get knocked out by the solid wooden and very heavy entrance and exit doors – and you may get a bit of vertigo looking down the vast escalators. But the Metro is clean and efficient and easy to navigate. Dating back to the 1930s, its consists of 12 lines and 192 stations and is 199.4 miles long. The average daily passenger traffic is 7 million so it’s a very busy place to be most of the time! All of the stations are wide and open with plenty of space – unlike the London Underground which has always made me feel a little claustrophobic. Some of the stations are architecturally very extravagant and artwork and sculptures feature in most. I couldn’t complete this post without mentioning my home town in Moscow, Frunzenskaya, where the Bolshoi Ballet Academy is based. Frunzenskaya is only four stops on the Metro from the Kremlin, St Basil’s Cathedral and the Bolshoi Theatre – all at the very heart of Moscow. 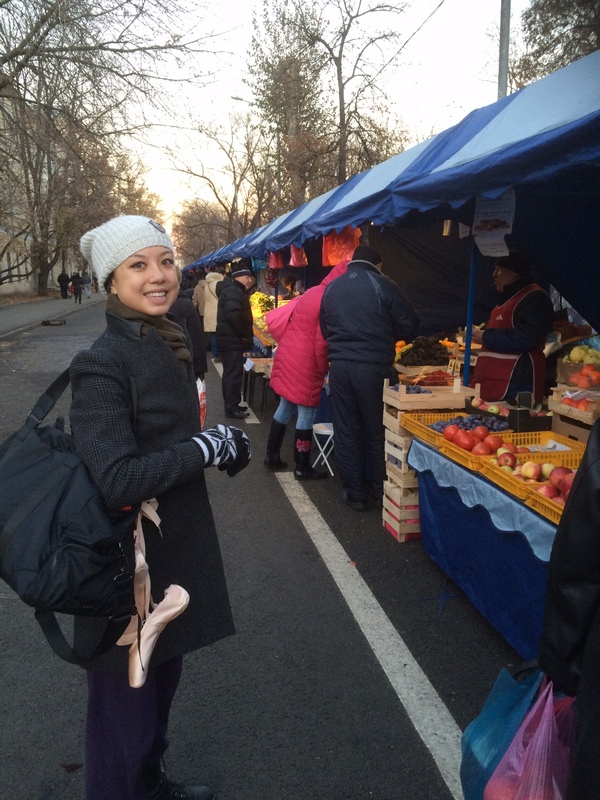 I have gotten to know Frunzenskaya very well – it is a residential area with its own centre of shops. I can source everything here, including food, clothing, internet and mobile communications. And though it may not seem at first glance to be anything special, it’s convenient, safe and a reliable “home” for me while I’m here. 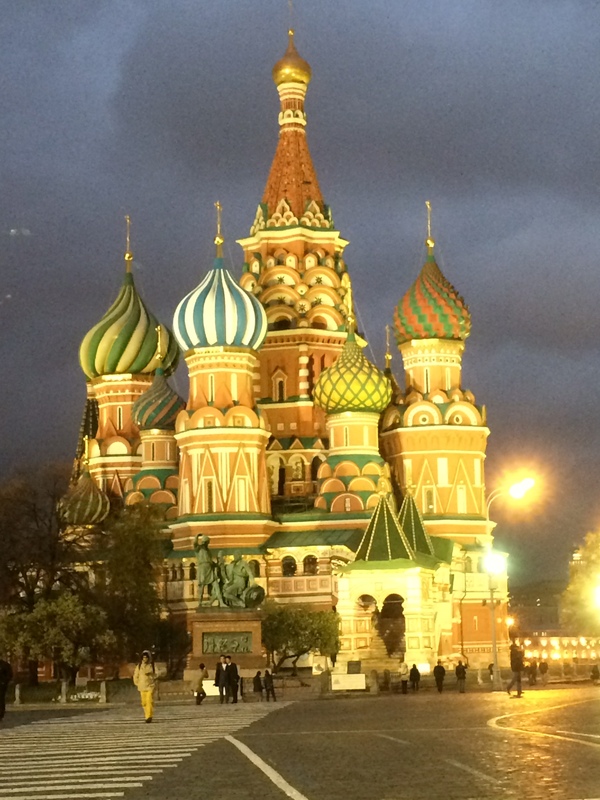 I hope you like my insight into Moscow. It’s a great place to live and I’d encourage anyone to visit. If you do, I hope you get chance to explore and find lots more exciting places in addition to the ones I have listed above!